"When these tech jobs go unfilled, it’s a missed opportunity for the workers, but it’s also a missed opportunity for your city, your community, your county, your state, and our nation"
On March 10, 2015, President Obama announced his TechHire initiative, a new campaign to expand local tech sectors by building tech talent pipelines in communities across the country. That announcement included three main components: (1) More than 20 communities with over 300 employer partners signed on to pilot accelerated training strategies; (2) large private-sector companies and national organizations committed to providing tools to support these TechHire communities; and (3) the President pledged $100 million in federal grant funding. Today, the number of TechHire communities has more than doubled, to 50. If your community is interested to join the TechHire movement, please scroll down for more information on the TechHire initiative and how to get involved. Consistent with the goals of TechHire, today, Vice President Biden and Department of Labor Secretary Perez are announcing the release of $150 million in new Department of Labor TechHire grants—which will support 39 public-private partnerships to help train tomorrow’s workforce in rapid-growth sectors like tech, healthcare, and advanced manufacturing. The grants will focus on providing workers the skills for a pathway to the middle class while providing employers with the skilled technology workers need to grow and expand. The Department of Labor estimates that more than 18,000 participants will receive services through the TechHire grant program. Over $125 million of the grants will go to partnerships that specifically target, train, and support young people, ages 17-29. In addition, $24 million will go to partnerships that help other disadvantaged groups with barriers to employment, including veterans, people with disabilities, people with limited English proficiency, and people with criminal records. The TechHire initiative launched in 2015 with 21 communities and over 300 employers committed to providing Americans with the accelerated, nontraditional technical training they need to obtain better jobs and achieve better futures. Since the launch of TechHire, the initiative has grown to 50 communities, committed to improving the lives of Americans. The President is challenging other communities across the country to follow their lead and get involved. On June 27, 2016 the Administration also launched South Central Appalachia TechHire, a joint effort by the Appalachian Regional Commission, the University of Virginia’s College at Wise, and private sector employers to develop a world-class ecosystem of tech talent in the heart of Appalachia. Together, South Central Appalachia TechHire will prepare and place over 50 individuals into tech jobs over the next year, and 400 by 2020. To learn more about TechHire in rural communities, check out the blog post from NEC Director Jeff Zients and Secretary of Agriculture Tom Vilsack. You can support the President's TechHire initiative on social media using the hashtag #TechHire. We would welcome the opportunity to work with you to highlight new, specific, and measurable steps that your community is ready to take in these areas. If applicable, your announcement may be incorporated into White House materials in the coming months and your organization and relevant partners may be invited to participate in upcoming White House events on this topic. Commit to become a TechHire Community or employer partner today! As a first step, we request you fill out the information at the link below, which requires coming together with partners across your region to develop an action plan for training and placing more people from your community into tech jobs. Please submit the form at the link below by August 31, 2016 for the next round of consideration. In fact, hundreds of thousands of these jobs require skills that can be learned not only in universities, but also in community colleges, in industry-certified training programs, in “coding boot camps” or in high-quality online courses. And they’re not just in Silicon Valley, or in the high tech industry – many are in industries we don’t think of as part of the technology sector – in health care, retail, manufacturing, financial services, energy, transportation, or in local government. Helping more Americans train and connect to these jobs is a key element of the President’s middle-class economics agenda. Employer demand for IT skills is everywhere-- and it is growing. Those ready to hire from both nontraditional and traditional training programs are reviewing and upgrading their hiring practices to integrate non-traditional hiring. Employers are also working to share robust data on where they have greatest needs and what skills they are seeking to help make sure that training leads to jobs. Explore the map below to find open IT jobs near you. In addition to strong four-year and two-year degree programs, new models have emerged for interested non-tech-experienced students to gain coding skills in months, not years. These new training programs can be run both independently or as part of a local community college or university education offering. Strong local leadership convenes and fosters communication, collaboration and innovation amongst local players. Mayors, council members, workforce development program offices and other local leaders can bring together employers, training providers and other key local players and commit to support the TechHire initiative. Explore the map below for communities that are already leading. Most cities have a broad spectrum of local leaders who can bring their resources and expertise to this effort. As an example, local tech community leaders can welcome new students to their tech meet-ups, startup weekends, developer hack-a-thons, campus tech and entrepreneurship groups and other local gatherings which are happening across our nation in most cities from Nashville to Boise. The TechHire initiative builds on work communities have already started to connect more Americans to well-paying technology jobs through a potent combination of new tools and training models. In March 2015, the President announced that 21 communities committed to take action – with each other and with more than 300 national employers – to expand access to tech jobs as they work to surface and support local employer demand. In June, during the U.S. Conference of Mayors, the President set the goal to double the number of communities participating in the TechHire Initiative to reach 42 in the first year. Since then, cities, states, and rural areas have been continuing to join. And on the one-year Anniversary of TechHire, on March 9th 2016, we announced the we have exceeded that goal with 15 new communities signing on, putting us at 50 total working with 600 companies. The maps below highlight the communities that are stepping up and responding to the President's call to action, and the jobs that are waiting for you in the tech sector. The first map shares stories about each community, the second shows how many open information technology jobs are in each community’s metro area (based on data from Burning Glass), and the third shows how many total information technology jobs are in each community (based on data from EMSI). And with that story, the President challenged communities nationwide to provide opportunities for their workers to access tech jobs. And now, a total of 50 communities have taken up that challenge. See additional TechHire stories below and in the Stories section, with thousands more still being told across the country. Whitesburg native Garland Couch found himself unemployed after being let go from a coal mining company in Southeastern Kentucky in 2014 after working there for two decades. He was out of work for three months until he found Bit Source, a 22-week software development training program, and was trained and hired as a computer coder. After graduating from his program, he found a job as a junior coder who creates websites and apps and games similar to the ones he loved playing during his lunch breaks at Arch Coal. Thaddeus Ducker came to The Software Guild in Akron at 23. As a warehouse operator making $30,000 per year, he was interested in technology and looking for a change. According to Thaddeus, “I got tired of working all my days away and not being able to enjoy my job or my life... So I decided that it was time to take my life into my own hands and stop having a job, and create a career for myself.” So he enrolled in The Software Guild as an apprentice. Using a program called Employer Connect, which pairs employers with apprentices, Thaddeus received an offer of over $50,000 from LeafFilter, a local company. Before Michelle Sinclair, age 31, joined the TechHire Pilot Program, she had been with the same employer for 4 years, with no further opportunity for advancement. Thanks to the training she received through the TechHire Nebraska Pilot, Michelle now has a new job as a Quality Assurance Analyst with Xpanxion, which better fits her interests and provides opportunity for growth. Lori Culberson, age 45, is a symbol of our dynamic economy—now on her third career, Lori’s friends know her for a “combination of incredible grit and a positive spirit” that lift those around her. Following a decade in K-12 teaching and coaching, Lori enrolled at the Turing School to become a software developer. Now, she is a developer at TeamSnap, making over $10,000 more per year than in her prior role. U.S. Army veteran and University of Minnesota graduate Chelsea Okey chose to attend PRIME Digital Academy in Minneapolis attain additional training. After completing the 18-week computer programming course, she joined the Minneapolis-based company SmartThings as a software engineer—in spite of having a non-technical background. S. Aaron Torres, a Colorado native, served 8 years on active duty in the U.S. Navy as an Electronic Warfare Technician. Following his service, he studied Pre-Law and became involved in advocating for veterans issues. In fall 2015, he decided to switch careers once more—to become an entrepreneur. He is currently in training at Skill Distillery, and at the same time, Aaron is helping to launch First Cloud Consulting as Business Development Manager. Tracie and Trayvon are twins who were homeless in Baltimore, Maryland before graduating from high school. Fortunately, their futures looked brighter when they found the Baltimore-based tech training program, Digital All Systems. In only two months’ time, they landed jobs with the company fixing computers and building networks. Now twenty-three years old, they are founders of a technology company called Street Geetz that specializes in fixing phones, computers, and networks. DC native Corrine Konoza graduated from college with dreams of pursuing a career in web development. Despite having some the college courses needed to fulfill her dream, she found herself unemployed and decided to join a six-month intensive apprenticeship program with Lamp Post labs in Chattanooga. She has since then relocated to the DC area and has taken on a senior full stack development position making a six-figure salary, all due to the accelerated training program. Allison Larson, 22, was a baker at a large grocery chain, kneading enough cookies on a daily basis to lose the feeling in her fingertips. She learned about Turing through a friend and applied, despite having no background in technology or programming. She went straight through the four quarters of Turing’s program, graduated in the top segment of her class, and relocated to New York City where she writes software for Bonobos and has tripled her prior salary. In Minneapolis, Victor Chege, originally an immigrant from Kenya, struggled to get a foot into the IT industry in the US despite having an IT background. As a result, Victor took cleaning jobs to make ends meet. Through Changing IT Futures Foundation’s IT Ready free, eight-week training program, not only was Victor able to obtain a CompTIA A+ certification, he also got connected to a 6-month paid work experience opportunity. Victor graduated at the top his class, and is currently an IT Service Desk Agent with the City of Minneapolis. Luz Tamayo, an immigrant to the US from Colombia, was a civil engineer by training—yet when her husband was diagnosed with cancer, she left the workforce to focus her attention on him. After her husband passed away, Luz found it difficult to find a full-time job. She enrolled in a CS50 course at Miami Dade College. After Luz completed the course, LaunchCode placed her in 3-month apprenticeship at MasterCard—and as a result of her training and hard work, she accepted a full-time offer. Geraldina Alvarez-Garcia was born in Venezuela and came to New York with her family. Unable to complete college for financial reasons, she joined the NYC Web Development Fellowship delivered in partnership with the Flatiron School and fell in love with technology. After 22 weeks of intensive training and an internship at Brooklyn-based Kickstarter, today this 23-year-old is employed as a full-time software engineer, a role which earns an average salary of nearly $80,000. Opportunity@Work unveiled today a new version of its TechHire.org website to provide additional resources to current and prospective TechHire communities and partners. Opportunity@Work is an independent civic enterprise launched in March 2015 and based at New America. TechHire.org will enable communities to share key information on their activities with their own stakeholders and with each other. This resource will also connect employers with quality candidates to fill their IT jobs through TechHire, share data on open IT positions, and provide an opportunity to share progress and exchange best practices. In support of the TechHire strategies, #YesWeCode commits to delivering $10 million in scholarships for 2,000 underserved minorities across the nation, to attend coding bootcamps over the next ten years. #YesWeCode also commits to launching a national job-training pilot in Oakland, California in 2015. Through this pilot, they will design a 9-month, industry-driven model to successfully prepare students from low-opportunity backgrounds for careers as software engineers. In partnership with celebrities, athletes, tech and political leaders, and other influencers, the mission of #YesWeCode is to find, finance, and encourage 100,000 non-traditional students to become top-level coders. AARP Foundation will train and place unemployed, low-income older workers in jobs in tech fields starting in San Antonio, Dallas, Denver, and St. Louis. Individuals will receive intensive preparation and coaching leading to certifications relevant to these fields as well as placement assistance upon completion of their certification. Jobs for the Future will develop a report to be released in March 2016 that highlights the work of six of the initial TechHire communities to consolidate lessons learned and allow communities to adopt best practices from one another. The report will include lessons from LA HI-TECH in Los Angeles, CA; Code Louisville in Louisville, KY; NYC Tech Talent Pipeline in New York, NY; Code Oregon in Portland, OR; TechSF in San Francisco, CA; and LaunchCode in St. Louis, MO and will be disseminated nationwide. Dev Bootcamp, a pioneer in short-term training that turns beginners into highly employable web developers, is donating $425,000 in tuition over the next year to get more women and underrepresented minorities into technology jobs. This will reduce the cost of tuition for Dev Bootcamp training from approximately $13,000 to $1,000 – enabling more people to develop the skills needed to access well-paying careers in tech and more companies to benefit from the perspectives generated by a more diverse talent pool. In communities adopting TechHire strategies, Cisco will provide select individuals interested in career opportunities in IT with access to a Cisco Learning Network Premium online subscription. This subscription will include IT networking skills training from the industry-leading Cisco CCENT®, CCNA®, and CCNP® certification content library, which consists of hundreds of assets organized by certification, technology, and learning modality. It also includes exam preparation materials along with access to virtual labs to teach and provide hands-on preparation for individuals interested in pursuing high-demand careers in networking-related fields such as network security, the Internet of Things, industrial networking, and enterprise network design. The Flatiron School, which trains people for jobs as software engineers and has over 99% job placement, is committing to provide technical assistance to local governments interested in increasing access to technical training to underrepresented groups in technology. 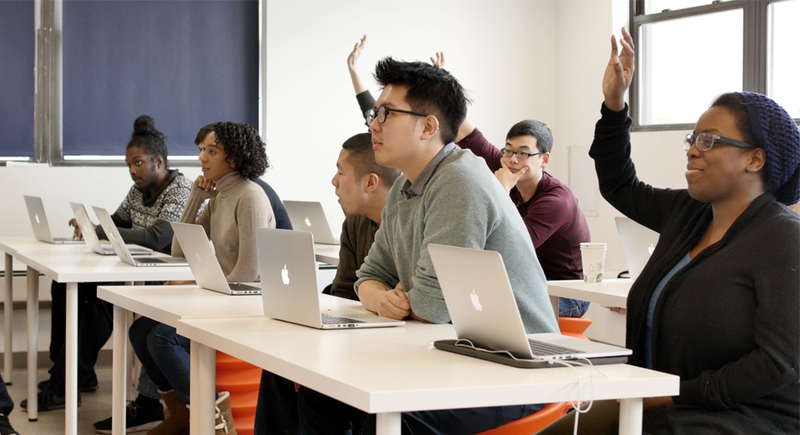 In partnership with the City of New York, Flatiron School runs the NYC Web Development Fellowship, which trains 18-26 year olds without college degrees, and places them in roles averaging over $70,000 average salaries. Flatiron will work with partners to share expertise relating to program and curriculum design, student and instructor selection, and employer partnerships to increase access to training and ensure successful job placement amongst diverse communities. General Assembly, a global educational institution offering training in technology, business, and design, has committed to taking the following actions by the end of 2015: Engage broadly and inclusively with community colleges, training providers, and employers with the aim of collaborating to further standardize web development training and pilot an online web development program with at least one community college system; educate at least 100 people through its Opportunity Fund, a philanthropic fellowship program that provides hands-on education, mentorship, and career opportunities to underrepresented women, people of color, veterans, and low-income individuals nationwide; and roll out an entry-level analytics curriculum for which scholarships will be available. Hack Reactor, a California-based collective of both in-person and online programming schools that graduates over 1,000 software engineers annually, has committed to engage with TechHire communities to open new programming schools across America. Their first campus, in Oakland, California, will open in the summer of 2015. Hack Reactor will engage with qualified communities to devise risk sharing, scholarships, and need-blind admissions systems to maximize the economic impact and opportunity for underrepresented communities and individuals. Hackbright Academy, a coding bootcamp for women, is working to close the gender gap in engineering and will commit staff, technical assistance, and travel time to engage with communities interested in starting or recruiting coding schools. In total, Hackbright Academy will make available 160 hours of staff time per year to consult with communities. In support of the TechHire Initiative, Microsoft will pilot an intensive and scalable Tech Jobs Academy to equip young adult learners with in-demand skills free of charge in order for them to obtain high-quality jobs and launch long-lasting careers in technology. This will build on Microsoft’s IT Academy, through which Microsoft is involved in 18 statewide public-private partnerships with 5,581 schools and community colleges taking advantage of IT Academy for technical skills development and career readiness. Microsoft is also partnering with Year Up in 2015 to provide 20 paid internships at its global headquarters and will offer additional paid internships to multiple coding bootcamp participants from disadvantaged backgrounds. Rural Sourcing Inc. (RSI), a firm focused on Domestic IT Outsourcing, will partner with interested rural communities to share free resources on: university partnerships, hiring practices, aptitude tests, and on the job training through internships and subsequent employment. Treehouse provides online training that aims to teach students job-ready training skills within 6-12 months. Over the next year, for each Employer Partnership made by Treehouse, they will provide a matching Treehouse membership to a nonprofit free of charge, targeting organizations serving populations that may not have access to traditional technology education. Udacity, an online education company that focuses on teaching individuals the technical skills they need to secure new jobs or advance their careers, has committed to 5,000 scholarships in its Nanodegree program for veterans, minorities, and other underserved students. Udacity will be matching these scholarships 1:1 together with leading tech employers, such as AT&T and Accenture, who are committed to broaden the tech talent pipeline. If fully utilized, this represents a total of $10 million committed by Udacity and tech employers. Year Up, a one-year, intensive training program that provides urban young adults 18-24 with a combination of technical and professional skills, college credits, an educational stipend, and a corporate internship, commits to serve 25 percent more young people – at least 500 more young adults – over the next 12 months. Year Up currently operates in 14 cities, and as Year Up continues to scale in the coming years, it will prioritize communities implementing TechHire strategies, focusing, in particular, on communities where large employers have committed to participate in this initiative and build new pipelines of talent. EdX, a non-profit organization founded by Harvard and MIT that offers free online courses in computer science and IT development training and from universities, colleges and institutions across the world, has committed to support TechHire by offering free verified certificates in two high-demand computer science programming courses to anyone in high need areas and communities implementing TechHire strategies. These free certificates, typically valued at $100, will be available for the next year. The courses will help to bridge the tech talent gap and skill-up unemployed and underemployed individuals. Sabio.la, a minority/woman-owned and operated web developer training program based out of Los Angeles, will create career-centric programming and curriculum to include web development training in communities and organizations. They will collaborate with LA Tech employers and recruiters to create its project-based curriculum and engage with elected officials from municipalities, school boards, non-profits dedicated to serving Latinos and African Americans to access their target populations. In addition, Sabio will commit to hosting free monthly coding workshops with nonprofits to increase awareness of the world of coding, and to increase access to free coding programs and resources. Galvanize, an education company focused on data science, web development and entrepreneurship, and IBM are expanding their partnership to support women in data science and data engineering. IBM will provide support to female participants in Galvanize programs including tuition assistance, mentorship, internships and employment opportunities. As part of the partnership, $150,000 will be committed to programs for female data scientists and data engineers. The company is committed to improving representation in the technology industry of women, African Americans, Latinos, people who identify as LGBT, and US Veterans. In partnership with the Department of Veteran Affairs (VA), the online education platform Coursera will offer every Veteran one free course certificate in a career-relevant course, such as data science or cybersecurity, that can be accessed online or at any one of the 27 in-person VA Learning Hubs that will launch this year in partnership with the American Red Cross and The Mission Continues. Learning Hubs combine the breadth and depth of Coursera’s online academic programs with the experience of having in-person Red Cross facilitators guide students through the curricula. The first Learning Hubs in Colorado Springs, Kansas City, New York City, Buffalo, and Honolulu will begin in August 2015. Codeacademy, a company that provides a free platform for individuals to develop employable programming skills, will host in-person meet-ups for 600 students from disadvantaged women and minority groups over a period of 12 months. At each meet-up, expert staff from Codeacademy will teach students how they can benefit from programming skills, provide an overview of popular coding skills, and provide attendees with guidance on resources to pursue technical job opportunities. Pluralsight is launching a $20 million in-kind philanthropic initiative to empower unemployed, job-seeking Americans with the programming and IT skills they need to begin and sustain well-paying careers in technology. The initiative, which seeks to lower unemployment and close the nation¹s growing skills gap in the technology sector, will offer 50 of the most relevant and critical technology courses and assessments from Pluralsight¹s expert-authored library to program participants at no cost. NACCE and the California Community College’s Doing What MATTERS for Jobs and Economy initiative commits to provide New World of Work 21st Century Employability Skills training to 20 TechHire communities including access to coaching and materials to implement and strengthen workplace learning programs. Course Report, a coding bootcamp directory and industry resource, aims to create transparency in the coding bootcamp industry around student and employer outcomes. In support of the TechHire Initiative, Course Report will commit to collecting and distributing data around Employer Outcomes while highlighting TechHire communities. With cooperation from hiring managers and over 70 full-time, immersive coding bootcamps in the US, Course Report will examine employer satisfaction and best practices around hiring from these non-traditional sources. Zenith Education group, one of the nation’s largest non-profit providers of career education, will partner with the Flatiron School to launch a bootcamp at Everest Institute in Austin, Texas—a newly announced TechHire community. Thanks to a grant of nearly $500,000 from ECMC Foundation and the support of the ECMC InnovationLab, Zenith expects to graduate more than 200 students in the next three years into in-demand jobs with average annual salaries of about $75,000. HackerRank, a platform that creates opportunities for programmers based on coding skills, will host a free online 24-hour “TechHire Hackathon” in 2016 for bootcamp students and companies in all 50 TechHire communities. This online hackathon will give student coders the chance to prove their skills to employers and connect to jobs. HackerRank will also help connect participants to job opportunities across the country, by sharing performance data with employer partners in TechHire communities. Better Weekdays is a St. Louis based job-matching platform that helps universities improve job placement outcomes of its graduates, and companies to hire them based on job compatibility and culture fit. Better Weekdays will commit to providing its pay-walled web and mobile career management platform free of charge for colleges and universities, Local Leaders, and other partners in TechHire communities to leverage and facilitate connections between employers and job seekers. The service will feature a dashboard that connects job seekers to resources to prepare for gainful employment, and allows employers to showcase their brands in a meaningful way to aspiring employees. CEB will develop their own best practices playbook for employers with CEB guidance to private and public employers on how to recruit tech talent from non-traditional sources. CEB will also provide free labor market snapshots from CEB Talent Neuron to select communities involved in the TechHire Initiative in order to surface job and skill segments where talent supply-demand gaps create opportunity for local workforce innovation. Knack will offer predictive algorithms to assess potential for success in IT jobs free of charge to employers, communities, and accelerated training providers looking to launch inclusive IT training and hiring campaigns aimed at identifying, training and hiring talent among minorities, women, and veterans. Knack makes smart mobile games that aim to uncover people's talent and potential for success on the job. Knack's technology aims to help employers to identify and target jobseekers with the potential for success in IT jobs – even if they don't have higher education or job experience. LinkedIn will draw from its Economic Graph data and work with interested communities to help job seekers decide where to focus their skills development, training providers align IT training with employer needs, and community partners focus on the jobs that are most in-demand. LinkedIn will also work in support of the TechHire initiative to find better ways to connect talent to training programs and job seekers to employers. Glassdoor, job and career marketplace that helps connect job seekers with employers, has developed a map-based tool for job seekers to search for open technology jobs. The company has also committed to providing interested communities adopting TechHire strategies with technical assistance to develop and publish interactive Glassdoor jobs data maps on their own websites to help local job seekers find available job opportunities. On March 8, JPMorgan Chase released a first-of-its-kind report to classify and offer information about the types of technology job training programs that exist, what employer needs these programs fill, and lessons from the tech-training field overall. The report is a comprehensive look at programs designed to teach information and communications technology skills, from apprenticeships to online courses to boot camps. The report, released by the firm’s foundation, reveals that the rapidly growing and quickly evolving tech training field faces unique obstacles and opportunities for developing the skilled and diverse workforce required to meet a growing need in our economy. I+E will launch a new TechHire Community of Progress that will work with all interested employers in TechHire communities to share competency based models, which make it easier for employers to recruit, assess, and hire talent that may have been trained in a non-traditional pathway based on demonstrated skills and abilities. The goal will be to scale up the number of employers who are doing “skills-based hiring” of their tech workforce from innovative training models like coding bootcamps and online programs. Learn more about TechHire activities already happening in communities across America. So far more than 150 students have gone through Akron’s TechHire training program, which includes the Software Guild coding bootcamp and Stark State College certificate programs. Over 130 program graduates have been placed by 72 companies, with an average starting salary for bootcamp graduates of $52,000. Training and community college partners will work with other organizations to recruit, organize, and coordinate local companies to host interns and apprentices from alternative pathways. The Software Guild, a "coding" bootcamp, has historically seen 95% placement rates. They will train over 350 candidates by the end of 2016. The Regional IT Engagement Board will engage companies including Progressive, as well as higher education institutions in a new, skills-based hiring and training pilot. Stark State College, one of the largest of 23 community colleges in Ohio, will assist in the development of short-term career enhancement programs, with participation from Summa Health System. With Stark State, the City of Akron has secured $4.5 million in funding to develop the Bits and Atoms Innovation Center, scheduled to be completed by December 2016 that will serve as an entrepreneurial hub for the community. In Alachua and Bradford counties, Santa Fe College in Gainesville, FL, CareerSource of North Central Florida (CSNCFL), the Gainesville Area Chamber of Commerce, and the North Florida Regional Chamber of Commerce will collaborate with Gainesville Dev Academy and others to train and place at least 300 individuals into programming and app development jobs by 2020. This program will help serve local tech jobs across all sectors, including local tech companies like Immersed Games, MindTree, Onward Development, NextGen, and Verigo. Since launch, the program has engaged over 300 local employer partners, including T-Mobile, Alliance Data, and Manpower. The city’s goal for 2015 is training at least 350 candidates for IT jobs. In addition, the city of Albuquerque plans to expand the Running Start for Careers program to include an IT and coding course. Talent Albuquerque (Talent ABQ) is a demand-driven initiative launched by Mayor Berry with Innovate+Educate, in which the industry partners are recognizing skills and competencies in their job postings, rather than only degrees or years of experience. The program has over 300 local employer partners, including T-Mobile, Alliance Data, and Manpower. The City of Albuquerque will include $200,000 in its FY16 budget to fund Talent ABQ’s work. The goal is to fill at least 5 percent of IT jobs based on skills and competencies rather than just degree and experience. Talent ABQ is mapping courses and curriculum across the City to IT jobs to ensure that people have access to training opportunities in IT. The mapping exercise will show a gap in IT jobs vs IT training. The city’s goal for 2015 is training and upskilling at a minimum 350 candidates for IT jobs. In addition, the city of Albuquerque plans to expand the Running Start for Careers program to include an IT and coding course. Led by the Anchorage Economic Development Corporation, the Anchorage Mayor's Office will work with University of Alaska - Anchorage, Code for Anchorage, Future Coders of Alaska, Lynda.com, and other programs to train and place over 600 workers into tech jobs by 2020. Once trained, program graduates will fill the needs of local employers including GCI, Anchorage School District, and Resource Data Inc, as well as help retain Anchorage's top talent. To help connect graduates to jobs, the Alaska Department of Labor & Workforce Development will collaborate with partners to improve the job seeking process. The State of Arizona Office of Economic Opportunity will leverage a “No Wrong Door” approach to recruit disconnected youth and nontraditional candidates into tech training and jobs across industries from aerospace & defense to financial services. The Arizona Tech Council, Arizona’s premier trade association for science and tech companies, will help leverage the resources of the tech community to focus on expanding tech talent, along with the Greater Phoenix Chamber of Commerce and other local organizations. In partnership with the University of Arizona and other local training providers, TechHire Arizona aims to train and place over 100 individuals across southern Arizona and Maricopa County over the next year, which is slated to increase to well over 500 individuals across Arizona by 2020. The City of Atlanta has partnered with The Iron Yard and TechSquare Labs to create accelerated training programs in Atlanta that prepare graduates for career opportunities with companies like Turner Broadcasting, Pindrop, SOLTECH, Luma, Springbot, WhatCounts, and the City of Atlanta Department of Information Management. Atlanta TechHire will train 100 individuals in software development and other high-growth IT occupations throughout 2016. Individuals trained through TechHire programs will be guaranteed interviews with Atlanta TechHire employer partners. An additional 300 individuals will be trained and guaranteed interviews with TechHire employer partners by 2020. The City of Atlanta Department of Information Management has committed to filling 20% of its job openings in FY2016 with graduates from TechHire programs. The City of Atlanta Workforce Development Agency will develop a clearinghouse of employer needs, training programs, and job seekers to connect qualified candidates to open tech jobs. Over 45 companies including IBM, Google, Microsoft, and selected members of the International Association of Microsoft Channel Partners (IAMCP) are sharing data on skills needs and taking a hands-on approach to curriculum design for accelerated training programs, so that Austin has ready-to-hire graduates from Austin Community College, Texas State University, local boot-camps like Zenith Education Group, and non-profit training organizations. Through these partnerships, graduates—particularly those from non-traditional backgrounds, including veterans, low-income residents, and those without a formal degree—will be assisted in interviewing for and/or finding paid internships or similar programs. Over the next year, Austin anticipates training and placing 250 individuals, and by 2020, Austin partners anticipate training and placing 400 individuals. Baltimore has made substantial progress on analysis of labor market data, assessment of the local training landscape engaging employers and building a governance structure for our broader tech ecosystem development. Composed of representatives from employers, business organizations, the Mayor's Office and Workforce Investment system, job seekers, youth leaders, local funders, tech experts and non-profit organizations among others, Baltimore’s Advisory Board has begun to meet and will continue to do so on a monthly basis to continue to build momentum around TechHire Baltimore. Baltimore employers including BGE, Kaiser Permanente, OneMain Financial, Johns Hopkins, the University of Maryland, Whiting Turner and others have partnered with the TechHire effort in various capacities including committing to hiring candidates based on qualifications rather than degrees, committing to offering internships or apprenticeships, and funding. TechHire Bellevue will bring together local employers, government and workforce development resources, with educational support from Coding Dojo and Bellevue College to facilitate training and hiring of local talent into tech jobs. The TechHire effort aligns with local employers' missions to increase workforce diversity. Examples include Microsoft's LEAP and Civic Tech programs, as well as Expedia, which has hired nearly a dozen Coding Dojo graduates to date. TechHire Bellevue will specifically target under-served populations locally, including minorities, veterans and the homeless, to help them learn and connect with local tech jobs. Birmingham has committed to training 300 people in fast track tech programs by the end of 2016 through expanding three main pathways. Since launch, 15 progressed through the first Depot/U, Birmingham’s first developer boot camp class in fall 2015. Birmingham has committed to train 300 people in fast track tech programs by the end of 2016. Innovation Depot, Birmingham’s epicenter for technology and entrepreneurs launched Depot/U, Alabama’s first developer bootcamp. Depot/U provides a rapid, non-traditional pathway to tech training for Alabama residents at nearly half the cost of leading national bootcamps and requires no prior programming experience. The University of Alabama at Birmingham (UAB) partners with the city to provide internship opportunities for urban college students in tech and to offer online training, cohort learning and mentorship. The Birmingham Business Alliance – representing nearly 1000 companies – talent recruitment project will be expanded to include an emphasis on tech sector jobs over the next 18 months. City partner MotionMobs also committed to provide free 12-week training courses to 50 individuals. Birmingham is also aiming to secure partnerships with 50 employers and training providers by the end of 2015. A regional consortium of Boston employers and training providers are blazing the path to IT jobs, led by the Boston Private Industry Council (PIC), the City's workforce development board, and SkillWorks, a regional funders' collaborative. Companies from a range of sectors-including healthcare, education, government, technology, and finance-will support. TechHire Boston plans to more than double the number of high school Tech Apprentices from 100 to 250 and increase the number of individuals connected to IT-related jobs to 500 by 2020. Buffalo County and the City of Kearney, Nebraska are partnering with Xpanxion, a professional IT services firm that has successfully provided nearly 100 IT careers in Central Nebraska, and Invest Nebraska, Inc. to launch a technology incubator that will support high-growth software startups in a rural environment. Since the launch, Xpanxion has hired 4 trainees and has developed a recruitment, assessment, and training model that would prepare all training participants to begin their IT career at entry-level jobs beginning in July 2016. Buffalo County and the City of Kearney, Nebraska are partnering with Xpanxion, a professional IT services firm that has successfully provided nearly 100 IT careers in Central Nebraska, and Invest Nebraska, Inc., to launch a technology incubator that will support high-growth software startups in a rural environment. The partners on this new initiative have also collaborated with training institutions on creating curriculum to make classes more relevant for workplace demand. Burlington, VT is bringing together employers and local partners to improve career pathways for tech jobs as a new TechHire Community. Vermont Healthcare & Information Technology Education Center (HITEC) is working with local employers to design education programs for their needs, all in the aim of making it easier for hardworking Americans to move quickly from training to jobs. For example, HITEC developed the IT Registered Apprenticeship Program which, in its first year, had 38 of its 39 enrollees successfully complete their apprenticeship and move on to steady employment with salaries up to $55,000. To expand on these efforts, Burlington hopes to train and place 75 tech workers in 2016 while collaborating with local employers and providers including Dealer.com, My Web Grocer, the University of Vermont, the University of Vermont Medical Center, Champlain College, VT Technical College, the Vermont Technology Alliance, and the Lake Champlain Regional Chamber of Commerce. Carroll County employers, training providers, and community organizations are uniting to train and employ more than 200 local tech workers by 2020. Led by Carroll Community College, the Carroll Technology Council and the Mid-Atlantic Gigabit Innovation Collaboratory, Inc. (MAGIC), a broad group of partnering organizations will connect local participants in leading-edge tech training programs to a network of over 520 county employers. CareerSource Central Florida is developing a coalition across sectors to train and place 100 people within the year and 400 people by 2020 into tech jobs, with an emphasis on serving underemployed, minority, and female candidates. The University of Central Florida, Valencia College, and Florida Institute of Technology will each play a role in developing trainings for students to quickly learn tech skills. Businesses from across Florida that participate in the Florida High Tech Corridor Council will support the initiative with an array of commitments, including commitments to consult on course design, interview candidates, and provide on-the-job learning opportunities. The City of Chattanooga is serving as the backbone entity for Chattanooga’s TechHire partnership. In addition, the City has allocated funding through its FY15 budget specifically targeted towards technology workforce in line with TechHire goals. An IT Task Force made up of employers such as Blue Cross Blue Shield of Tennessee, Unum Group, The Lamp Post Group, EBP, and Erlanger Hospital will determine the skill-needs of employers, and training partners including Chattanooga State Technical Community College, A.I.R. Labs, Public Education Foundation, TN Code Academy/ Girls Who Code, and the Chattanooga Public Library 4th Floor will establish goals for recruiting and training diverse and nontraditional candidates to fill these important jobs. As of 2015, Cincinnati has already placed over 100 students trained and employed by these initiatives. With the addition of the new TechHire initiatives, Cincinnati aims to significantly increase access to tech training in the coming years including enrolling an additional 200 students in 2016. A coalition is collaborating to implement Cincinnati’s TechHire initiative, hiring from non-traditional pathways, and coordinating collaboration among stakeholders. Key elements include INTERalliance, a non-profit that encourages the pursuit of IT careers; Per Scholas, a non-profit that will train and place 80 individuals, half of whom are women and minorities, into entry-level IT roles; and Girl Develop It, focused on training women in web and software development. The city is also expanding a bootcamp program to train candidates with little to no IT background. In the first cohort (25% women and 50% initially unemployed), 90% were hired with salaries as high as $80,000. In addition, the Cincinnati Business Committee and the CIO Roundtable will seek to hire diverse, non-traditional candidates. As of 2015, Cincinnati has already placed over 100 students trained and employed by these initiatives. With the addition of the new TechHire initiatives, Cincinnati hopes to enroll an additional 200 students in 2016. Colorado is committed to increasing the number of students to go through training in high-demand occupations in partnership with the office of Representative Dan Pabon, and state agencies. Since launch, it has already built excellent training programs supported by the Office of Economic Development and International Trade (OEDIT) and the Colorado Department of Labor & Employment (CDLE). Colorado commits to launch a new program aimed at filling high paying jobs in Colorado with skilled, qualified people. The Initiative will work with industry leaders and training programs to increase the number of students to complete training, as well as increase pathways into high-demand occupations in 2015. Colorado has already built excellent training programs supported by the Office of Economic Development and International Trade (OEDIT) and the Colorado Department of Labor & Employment (CDLE), and this program will further augment this work by increasing engagement and industry awareness. Founding partners from the private sector include the Colorado Technology Association, Swiftpage, and Denver-based training program Seedpaths. Several of Delaware’s biggest employers joined with the state to train and hire hundreds of Information Technology workers through accelerated education programs and a “coding school” in fall 2015. Delaware has since then launched Zip Code Wilmington, the state’s first coding bootcamp, which had 16 graduates in its first cohort. Over 200 applications have been received for Zip Code’s second cohort, which started in January of 2016. As part of Governor Markell’s efforts to rethink the state’s approach to workforce training for the new economy, several of Delaware’s biggest employers are joining with the state to train and hire hundreds of IT workers through accelerated education programs and a “coding school,” launching this fall. Six employers, including JP Morgan Chase and Capital One, have committed to hire those who successfully complete the program. Fifty to 100 people are expected to participate this fall, preparing for jobs as entry-level Java developers and IT infrastructure support workers. In partnership with the City of Detroit, Grand Circus Detroit will continue in its mission in 2015 by training more than 200 students for high demand careers in IT, including a primary emphasis on accelerated training. Their primary goal is to service the needs of local employers looking for entry-level IT talent, and their training topics will reflect those needs. The partnership in support of TechHire will involve employers representing the largest of the 30+ local employers including GM (Onstar) Quicken Loans, and Blue Cross Blue Shield of Michigan who will interview and hire qualified Grand Circus graduates. In total, partner employer partners represent roughly 80 percent of IT positions open in the City of Detroit. Over 900 people have indicated interest in BitSource, one of the education groups’ training programs in rural Kentucky. Targeting dislocated coal-industry workers, BitSource has trained and placed 11 people into employment in its pilot year. The Eastern Kentucky Concentrated Employment Program, Inc. (EKCEP)--the Workforce Investment Board that administers federal workforce programs in 23 Eastern Kentucky counties--is leading regional convening efforts that are bringing together educational groups, nonprofits, and employer partners. This group will collectively design and establish a strategy and economic development plan to make accelerated IT training--and the resulting, high-demand jobs--available to Eastern Kentuckians, who may not have computer science degrees but have the ability and adaptability to learn and work in the IT field. Emerging companies in El Paso County will soon have an influx of talent, thanks to collaboration among the Workforce Solutions Borderplex Development Board Area and local partners to lead Reboot El Paso, a collective effort to create and expand IT career pathways. The initiative aims to train and place 400 individuals into tech jobs by 2020. First, the coalition will build awareness among non-traditional candidates, with an emphasis on veterans, the long-term unemployed, and youth. Then, the coalition commits to develop a pipeline to jobs with employer partners and assess applicants for fit to the jobs with competencies rather than credentials. Finally, the coalition will connect graduates to jobs. As part of Flint’s broader economic development strategy, the City created the Greater Flint TechHire Initiative to train 400 individuals by 2020 for employment opportunities. Social Impact Philanthropy and Investment (SIPI) will partner with the Flint & Genesee Chamber of Commerce with local employers, including sipIT, the Disability Network, and the Michigan Employer Resource Network Team (Michigan ERN), which engages 77 employers throughout Michigan. In partnership with Mott Community College, Flint TechHire will train individuals via a range of programs for the skills they need to land in-demand tech jobs in less than a year. To connect Flint TechHire graduates with jobs, SIPI and the Chamber of Commerce will work with local employers to recruit, interview, and place program graduates. In the next six months, Honolulu WorkLinks working with the CIO Council of Hawaii and the High Technology Development Corporation will ramp up tech training, along with an expanded DevLeague bootcamp, Honolulu Applied Computer Training and Technology classes, and U.S. CAD classes. By the end of the first year, job-seekers from nontraditional backgrounds will be considered for 175 open jobs with some of the largest employers in Hawaii—and in the next 3 years, that number will more than double to 400 new employees from nontraditional backgrounds at companies like Ike, and Ikayzo. Leveraging live video technology at community colleges, the TechHire program will provide accelerated training to all the islands of Hawaii, including rural areas. TechHire is also part of a broader effort in Hawaii to meet its 80/80 Initiative to create 80,000 new technology jobs earning over $80,000 per year by 2030. Indianapolis TechHire will respond to the need for tech talent in Central Indiana, which is projected to have 51,500 new technical jobs in 2025. The City of Indianapolis, EmployIndy, and TechPoint will bring together employers like Angie’s List, Apparatus, Blackboard, Bloomerang, Fiber Indy, Interactive Intelligence, NetLogix, TCC Software Solutions, and WDD Software Solutions to train and find jobs for 186 people in 2016 and 560 through 2018. EmployIndy and partners will also pilot “Code Indy,” a training program targeted toward adults and youth with barriers to training and employment, as well as fund curriculum development at Eleven Fifty Academy to deliver coursework to up to 1,000 students of varied ages and backgrounds. Howard Community College and the Howard Tech Council (HTC) will come together to train individuals for jobs in tech fields including computer science, information technology, cybersecurity, and computer forensics. Howard County's TechHire initiative will leverage an apprenticeship model, whereby trainees can participate in on-the-job learning with the over 200 regional employers that participate in Howard Tech Council. By 2020, the Howard County TechHire initiative aims to train and place 800 individuals, with an emphasis on the long-term unemployed, minorities, and the military. The City of Jackson is convening employers from the Greater Jackson Chamber Partnership of Mississippi with Hinds Community College, Jackson State University, and other training providers to train 250 candidates in 2016 and 1,000 candidates by 2020 with the skills they need for open tech jobs. Students will prepare for work using personalized trainings developed as part of the MI-BEST workforce training program, which connects trainees with the skills employers need. The Greater Jackson Chamber Partnership of Mississippi will facilitate hiring of trainees by employers seeking tech talent, from healthcare to state government, among others. West Tennessee’s regional innovation center, theCO, is partnering with employers to expand its Code Catalyst Program to adults by training and placing 100 adults into paid internships, apprenticeships, and jobs in 2016, with a focus on re-entry of former criminal offenders in Jackson, Tennessee. By 2020, theCO hopes to expand Code Catalyst to up to 350 individuals trained and placed into jobs with the help of Personnel Placements, Allygn, and the Chamber of Commerce. Employer partners such as Jackson Energy Authority will work with training provider partners to ensure that TechHire graduates have the skills they need to fill and keep an open job. The City of Kansas City, MO, in partnership with the Full Employment Council and Think Big Partners, will provide accelerated technology training to the chronically unemployed through the "Reboot U” program. So far, 35 individuals have been hired through non-traditional sources and 42 have been given paid internships or apprenticeships. 139 of them have completed training and 44 are still in training. Average salary of paid individuals are $20.05 per hour. The City of Kansas City, MO, in partnership with the Full Employment Council and Think Big Partners, will provide accelerated technology training to the chronically unemployed through the "Reboot U” program. The University of Central Missouri and Metropolitan Community College have committed to providing customized training to program participants in three technology sectors: healthcare organizations, small businesses, and large end-user IT firms including Children’s Mercy Hospitals and Clinics University of Kansas Medical Center, and Wireco World Group. Partners will leverage a $500,000 grant from Missouri Division of Workforce Development. Partners will provide training opportunities that include a “shark tank” styled initial interview, generalized training in core IT competencies, specific sector training crafted by experts in target industries, and an 8-12 week paid internship or apprenticeship. Currently in year 2, LA HI-TECH has established close to 20 new classes that are dual enrollment or articulated classes in high schools that are leading to community college pathways. To date, the Bixel Exchange at the LA Area Chamber of Commerce has recruited more than 50 tech companies in the Los Angeles region with LA HI-TECH programming, including but not limited to: classroom visits, guest speaking opportunities, job shadowing, career fairs, company tours, project-based workshops, teacher externships, curricula development, and mentorship. The Los Angeles High Impact Information Technology, Entertainment-Entrepreneurship, and Communication Hubs (LA HI-TECH) regional consortium makes it possible for 4,000 high school and community college students to acquire the skills needed for education and employment in these sectors, critical to the LA regional economy. Together, they will create a more technically-skilled workforce and strengthen the technology ecosystem in Los Angeles. LA HI-TECH is led by Los Angeles City College, Santa Monica College, and Pasadena Community College, which serves as the fiscal lead, funded from California Career Pathways Trust funds. In total, it includes eight community colleges and 30 high schools local districts and charters multiple agencies, and 100 employers. Louisville has committed to convene over 20 Louisville companies with IT talent including Glowtouch, Appriss, Humana, Zirmed, and Indatus to launch Code Louisville—a free-to-the individual approach to train and place at least 850 new developers over the next three years. Since the TechHire initiative announcement, 288 individuals have completed a 12-week course with Code Louisville, 72 of the 288 have completed a 14-week course, 9 have completed a Software Guild course. 43 individuals have been hired through Louisville’s programs. Mayor Fischer has convened over 20 Louisville companies with IT talent including Glowtouch, Appriss, Humana, Zirmed, and Indatus to launch Code Louisville—a free-to-the-individual approach to train and place at least 850 new developers over the next three years. Building on this work in support of TechHire, Louisville is committing to recruit a high-quality coding bootcamp locally, and establish a partnership between Code Louisville and degree-granting institutions. They will also establish a clearinghouse/intermediary for IT talent that will partner with companies employing at least 33 percent of the software developer/IT workforce and work with employers to establish a baseline skillset that a large number of employers agree on. Local employers in Lynchburg have pledged over 400 paid apprenticeships over the next four years. These apprenticeships will be available to Lynchburg residents between the ages of 17-29 with a barrier to employment, and who is not currently enrolled in secondary or postsecondary education. They will have to complete an accelerated learning program with the employers prior to starting their apprenticeship. Lynchburg is partnering with SharpTop Co., a local software development company, to develop and pilot a nanodegree program that will give students the practical knowledge necessary to enter a specific industry. The Lynchburg Beacon of Hope, a non-profit community partner, is developing a virtual career center to serve local students and to connect students with career and educational opportunities. Central Virginia Community College, a bridge between employers and the local workforce, is convening regularly with employers for feedback on curricula. The city is partnering with employers including BWXT, Delta Star, TRAX, llc., and NovaTech to revise their recruiting processes to accept more individuals with nanodegrees. Lynchburg has also committed to training 75 people with these nanodegree programs by the end of 2016 and aims to have a total of 15 employer and training provider partners by the end of 2015. Ten Maine employers are committed to recruiting and hiring candidates, based on their demonstrated technology skills regardless of where they gained them. To that end, Maine designed an accelerated, competency-based “Foundations of IT” bootcamp to assist non-traditional candidates with preparing for paid internships. Since the TechHire initiative announcement, Maine employer partners has offered approximately 140 computing and IT internships across a number of sectors every year. They are also working with many higher education institutions to develop curricula that are in demand, and with K-12 students and educators to expose them to opportunities and careers. Ten Maine employers — including WEX, IDEXX Laboratories, MaineHealth, Maine Medical Center, and Tyler Technologies — are committing to recruit and hire candidates based on their demonstrated technology skills, regardless of where they gained them. Project>Login, a program within non-profit Educate Maine, will receive over $150,000 in support from corporations and public and private universities and colleges to further their work in getting more Maine citizens into these technology jobs. In addition, over 20 employers — including WEX, IDEXX Laboratories, the State of Maine, the Jackson Laboratory, and Activision Blizzard — have projected they will hire 140 paid interns in 2015, and Project>Login is promoting those paid internships to draw a larger and more diverse group toward these pathways. Since launch, Tech901, WIN’s TechHire Community Partner, has been instrumental in providing students ages 17-18 with training for Comptia’s A+ certification program. A total of 290 individuals have completed high-quality accelerated training programs. The Memphis Workforce Investment Network (WIN) will work with training providers and eight Memphis businesses-- including Unistar-Sparco, Tate Systems, and Memphis Light, Gas and Water-- to create a new ReadyWorkIT Internship and Apprenticeship program. It aims to train and place 50-75 underserved students, with IT Support, Software Developer, and IT Security Support accelerated certification classes. Ethos Project will work with employers to assess high quality candidates according to employer needs and program requirements, and will oversee job placement for graduates. Memphis will also launch a marketing effort to increase the number of underrepresented women, veterans, low-income community citizens, and youth age 18-24 entering into IT as a career. The city will also direct students to repurpose WIA & private funding to finance accelerated training. CareerSource South Florida and LaunchCode are leading Miami’s efforts to train and place 1,190 individuals into tech jobs by the end of 2017 and up to 2,415 individuals by the end of 2020. Miami currently has 140 companies committed to interview qualified candidates that graduate from Miami TechHire’s training partners, including Miami-Dade College, Wyncode, Code Fever Miami, New Horizons, Florida Vocational Institute, the Academy of South Florida and Ironhack. To facilitate the hiring of graduates from programs provided by training partners, CareerSource South Florida and LaunchCode help connect job-seekers with committed companies that have tech job openings, such as HBO Latin America, Office Depot, and Oracle. The Beacon Council, along with the Greater Miami Chamber of Commerce, Miami-Dade Chamber of Commerce, and e-Merge Americas will lead efforts to ensure that employers’ commitments to the community of Miami are fulfilled. Employ Milwaukee will lead Milwaukee’s TechHire Initiative to train and place 150 individuals facing significant barriers to employment into tech jobs by 2017, a number that is expected to increase to 600 by 2020. The Housing Authority of the City of Milwaukee’s Milwaukee TechForce Center—an IT training center in the heart of the city—will provide accelerated training to employer-vetted individuals, to get in-demand skills. Graduates of the TechForce Center will be connected to paid internships, apprenticeships, and full time jobs with support from Employ Milwaukee’s Industry Advisory Boards and employers from the Milwaukee 7, Metropolitan Milwaukee Chamber of Commerce, the Water Council, the Center for Healthcare Careers of Southeastern Wisconsin (CHCSeW), the Mid-West Energy and Research Consortium, and IT United of the United Way of Greater Milwaukee & Waukesha County. In its pilot year, Minneapolis TechHire, as of February 2016, has 285 trainees completed accelerated programs, with 135 graduates placed in full-time positions, with salaries averaging $48,364. They started with 60 employers and are now up to 150 engaged employers. The Minneapolis region will expand upon three accelerated tech training programs operating in the region – Prime Digital Academy, IT-Ready, and Concordia University – that will be training a combined 300 individuals this year for entry level software positions. The region’s work also includes commitments from over sixty employers including 3M, Target, Thompson Reuters, Best Buy and Wells Fargo and apprenticeship partners representing thousands of software development, networking, and technical support jobs. They will train and place workers without traditional IT backgrounds in software engineering and support roles. Through partnerships with the City of Minneapolis, the State of Minnesota, the Creating IT Futures Foundation, the local non-profit Jewish Family and Children’s Services, and the Minnesota High Tech Association, the local alliance will increase the accessibility of the programs by making funding available for qualified students who would otherwise be unable to afford to attend. The City of Mobile, Alabama will partner with the Gulf Coast Technology Council and 17 employers to develop industry-driven training, including customized capacity building for incumbent workers, a coding bootcamp pilot, and advanced manufacturing technical trainings for entry-level job seekers. The trainings will be facilitated by Depot/U, Iron Yard, and General Assembly. This program will include opportunities for trainees to network with local employers seeking talent, including Accureg Software, AM/NS Calvert, Rural Sourcing Inc., and The Red Square Agency. By 2020, the collaborative aims to train and hire 500 technical workers, including those who are underemployed and dislocated, boosting Mobile’s burgeoning tech community. To promote IT careers, the Nashville Technology Council (NTC) is leading a regional partnership with local economic development agencies, 43 Middle Tennessee employers including Nissan, the Hospital Corporation of America, and Bridgestone Americas, accelerated learning centers, community colleges, four-year universities, and local K-12 school systems. Partnering employers are committing to fund $1.7 million for internships for 291 community college students. The NTC will also aim to conduct an assessment of local technology industry job specifications, hiring practices, and internship programs to better align their curriculum with business needs. The New Haven TechHire initiative including partners from city government, the Workforce Alliance, the Justice Education Center, CT Department of Labor, Career Resources, New Haven Works and others, will launch a pilot program to train and place more than 100 residents over the next year, including individuals with criminal records. Additionally, they will expand programs that reach youth with criminal records annually to include an IT training component. New Haven is also initiating a new program to train incarcerated people at the Whalley Correctional Institution in tech programming skills. The City of New Orleans is working with local non-profit organizations, such as Operation Spark, to train 80 youth belonging to underrepresented populations in technology. Graduates will prepare for entry-level coding jobs by summer 2016 through 4- to 12-week bootcamp-style training courses. The program currently includes a coding bootcamp located at the juvenile detention center and a partnership with career accelerator Hack Reactor – a San Francisco-based career accelerator – to train underrepresented youth and adults in higher-level tech skills required for well-paying jobs in software development. New Orleans is working with GE, the Ford Foundation, W.K. Kellogg Foundation, Living Cities and Bloomberg Philanthropies, as well as local employers such as Ochsner Health Systems, Federated Sample, and Geocent, one of the region’s largest IT firms, to help the city develop employment pathways for internships and full-time careers in software development for its residents. Within the last 12 months, the NYC Tech Talent Pipeline has worked with 150 employer partners to deliver quality talent for NYC businesses and quality jobs for New Yorkers. This includes fulfilling their commitment to prepare over 100 college students within the City University of New York (CUNY) system for, and connect them to, paid internship opportunities at local tech companies through programs like CUNY Tech Prep, TTP Residency @ Queens College, and the Brooklyn Tech Triangle Internship Program. They have also and expanded successful models like the NYC Web Development Fellowship Program serving 18-26 year olds without a college degree in partnership with the Flatiron School. NYC Mayor Bill de Blasio has launched the NYC Tech Talent Pipeline, a $10 million industry partnership designed to deliver quality jobs for New Yorkers and quality talent for NYC businesses. Together with over 100 employers, including Microsoft, Verizon, Goldman Sachs, Google, Gilt Group, Facebook, AT&T, Etsy, Kickstarter, Infor, AppNexus, LinkedIn, and JP Morgan, the NYC Tech Talent Pipeline will announce new commitments. These include the most recent to prepare over 100 college students within the City University of New York (CUNY) system for, and connect them to, paid internship opportunities at local tech companies and expand successful models like the NYC Web Development Fellowship Program serving 18-26 year olds without a college degree in partnership with the Flatiron School. Oakland committed to placing 400 individuals into paid internships or full-time jobs by the end of 2015. In 2016, Oakland will be expanding partnerships with companies located throughout the East Bay to support diversity in hiring, mentorship and other programs. Oakland is committing to place 400 individuals into paid internships or full-time jobs by the end of 2015 through several accelerated pathways. First, Oakland partner #YesWeCode is providing low-cost access to coding bootcamps, as well as 300 apprenticeships and job commitments from over 200 partners including Square, Lyft, Pinterest , and Twitter over the next five years. In addition, Intel has invested $5 million into the Oakland Unified School District to support engineering and computer science programs that will reach 2,400 high school students. Intel has committed to continue this support for these students through college and on to placements within the company. Companies including Pixar and SAP are also investing in computer science programs in Oakland schools to expand their hiring pipelines and student access to tech jobs. StarSpace46, Inc., Creative Oklahoma, and Techlahoma Foundation will work with fast-track and agile training programs to train and place 500 IT workers by 2020. With commitments from employers spanning from the aerospace sector to the not-for-profit sector, trainees will gain and utilize skills in native mobile development, user interface design, and front-end and application development. Students will also gain access to mentorship in entrepreneurship and business. Omaha is bringing together AIM and the Greater Omaha Chamber of Commerce, including traditional and start-up employers alike, in their effort to develop a local tech training and employment ecosystem. Local training bootcamps have committed to help train over 1,000 people by 2020, to help fill local tech jobs in industries from financial services to tech. Pensacola State College will collaborate with employer convener Innovation Coast, Inc., including community workforce partners Global Business Solutions, Inc. (GBSI), Technical Software Services, Inc. (TECHSOFT), Gulf Power Company, AppRiver, and the Institute of Human & Machine Cognition (IHMC), to train and place 200 technology workers by 2020. With a focus on veterans, minorities, and economically disadvantaged individuals in the Pensacola area, students can gain skills across IT fields, including cybersecurity, coding, and networking. In addition to training, this initiative includes opportunities to make connections with potential employers and reduce unemployment. In May 2015, Philadelphia launched a new partnership with Per Scholas and Creating IT Futures. Philadelphia employers-- including Comcast, Accenture, Alteva, Aramark, Excelon / PECO, Independence Blue Cross, and Ernst and Young—as well as educators, city officials, not-for-profits and employers have come together to design and build a program – PhIT for the Future – that will train and develop talent in core IT skill areas to provide employers with a talent pool that can close the skills gap in the city. Employers have committed to providing paid internship including on-the-job training and mentorship opportunities to qualified graduates of these programs. Philadelphia will also launch a new partnership with Per Scholas and Creating IT Futures with the first cohort to start in May 2015. So far, 10 STEM youth programs were piloted during the Learn and Earn Program Summer Youth Employment Program. The STEM pilot programs are beginning to fill in this gap by serving approximately 300 youth between July and September 2015. Pittsburgh will pilot several accelerated training programs that will provide training to over 500 individuals by the end of 2016. The city also aims to increase the number of people of color in the technology workforce by 200 by the end of 2016. Pittsburgh has already secured funding to financially support trial periods of employment for job seekers with severe barriers to employment. In addition, the 3 Rivers Workforce Investment Board is supporting over 400 youth jobs within STEM fields this summer and is allocating $1 million toward creating IT and technology career pathways for disadvantaged youth. The Pittsburgh region is actively pursuing expansion of computer programming training in all high schools. The Community College of Allegheny County facilitates the access to job opportunities in the growing IT sector by offering stackable micro-credentials. Since launching Code Oregon in June 2014, over 16,500 Oregon residents have signed up to build coding skills. More than 150,000 badges have been earned and nearly 300 language tracks completed. A Code Oregon Job Fair held in December 2015 attracted 300 talented job seekers vying for positions with nearly 20 local employers. Portland is working with employers including Square Space, Metal Toad, and Portland General Electric to fill the 2,400 technology job openings in the Portland Metro area. Code Oregon is dedicated to teaching 10,000 Oregonians how to code and find careers in tech, with online classes offered for free through funding from Worksystems and the State of Oregon, and delivered by employer partner, Treehouse. Graduates are connected to local technology opportunities through WorkSource, the region's public workforce development system. In support of TechHire, Portland commits to offer 100 on the job-training opportunities and 50 paid internships. In addition, Portland will partner with JP Morgan Chase to recruit tech mentors to support underserved communities, and providing transferrable college credit to 60 students who complete the accelerated Code Oregon pathway model. In Puerto Rico, co-working space Piloto 151 and Codetrotters Academy have launched a strong public-private partnership with support from the Puerto Rico IT Cluster, the Puerto Rico Department of Economic Development (DDEC) and the Puerto Rico Science & Technology Research Trust. The Puerto Rico TechHire initiative will bring together a wide range of local technology companies and startups, including Rock Solid Technologies, Spotery, Migo IQ, and Wovenware, among others, in order to train and place 100 workers into tech jobs over the next year, ramping up to 300 workers by 2020. In partnership with NC State University, Wake Technical Community College, and other local training providers, Raleigh is expanding training in programs, from technical maintenance and cyber defense to Java coding. The City is also working with employers to place 50 nontraditionally-trained workers into jobs within the first year, and 350 TechHire graduates into jobs by 2020. Over 20 employer partners have committed to identify and fill critical talent needs as part of the Raleigh initiative. Moreover, Raleigh will create a business incubator with private-sector partners as part of a fully-revamped Business & Technology Center, to diversify leadership, create jobs, and improve access to entrepreneurship programs and non-traditional training programs. Rhode Island has assembled 18 employers to recruit over 2,000 candidates from fast-track tech-training programs that will be developed and expanded over the next five years. Since launching, the TechForceRI program funded by the Ready-to-Work Grant, Tech Collective has trained and placed 12 dislocated workers in IT jobs. Rhode Island has assembled 18 employers including CVS, Citizens Bank, Fidelity and Innovex to recruit over 2,000 candidates from fast-track tech training programs that will be developed and expanded over the next five years. The Department of Labor and Training, Commerce RI and Opportunity@Work are working with Tech Collective, a non-profit workforce intermediary, to strengthen Rhode Island's IT workforce pipeline and train individuals, with a focus on low-income community members. Additionally, P-Tech, a $900,000 initiative in collaboration with IBM, enables high school students to earn an associate's degree through a six year program and provides a formal pipeline for internships and full-time employment into the company. The SmartRiverside TechHire community includes the Riverside County Workforce Development Agency, Riverside Community College District, Vocademy makerspace, and the Greater Riverside Chambers of Commerce, committed to connecting 4,000 people to tech jobs over the next five years, including 500 in 2016. Regional employers such as Loma Linda University Medical Center, Garner Holt Productions, ESRI, Riverside Public Utilities, Zodiac Aerospace, Paulson Manufacturing, Xerox, and Bourns, Inc. have committed to hire or provide paid internships for 500 employees from nontraditional, technical pathways in 2016. These nontraditional pathways will be developed by Vocademy, Riverside, Community College District, and other accelerated training partner programs that are preparing to launch in 2016 to meet tech employers’ needs across a wide range of opportunities, such as cybersecurity, data analytics, healthcare IT, web and mobile development, CADCAM, Electronics and Robotics, and CNC Machining. The City of Rochester estimates that over the next year, 1,000 IT jobs will be created in the Rochester area. TechHire Rochester is in the final stages of planning the launch of the first cohort class. They have formed a partnership that includes Monroe Community College, the Greater Rochester, Chamber of Commerce and the Finger Lakes Regional Economic Development Council. The City of Rochester estimates that over the next year, 1,000 IT jobs will be created in the Rochester area. The city will work the Chief Information Officer to establish commitments from companies to provide at least 50 paid internship opportunities to candidates who have successfully completed the accelerated program at Monroe Community College. These programs are modeled after the successful implementation of the customized advanced manufacturing modules that have an average cohort completion rate of 80 percent and an 80 percent job placement rate. Salt Lake City has engaged the support of 15 employers in creating career pathways for in-demand IT jobs. So far, nearly 70 students have expressed interest in the developing training and career pathways to be offered by Salt Lake City. The Salt Lake City municipal government is committed to fostering additional connections between employers with open tech jobs and education providers focused on underserved residents. The Salt Lake City economic development team will support “fast-to-work” training programs that are tailored to specific employers’ needs through a business loan fund, office space support, marketing assistance, and other methods. The city is also partnering with local businesses to create a scholarship fund for qualified residents. And the region is seeing growing participation by nontraditional IT students through programs like a local Code for America brigade, the Open Salt Lake initiative, Girl Develop It, and the Utah Geek Association. Partners like TechSF and Jewish Vocational Services have trained over 100 individuals through their training programs in programming and digital marketing. TechSF has also trained 58 low-income, unrepresented minority residents in the city through its pop-up coding labs. Last year, San Francisco placed 50 TechSF participants in tech-related internships and 200 underemployed TechSF participants into full employment – they aim to meet these numbers again in 2015. To integrate training opportunities that bridge institutions and innovative accelerated learning approaches, San Francisco will build out a broader spectrum of training opportunities for diverse job-seekers, including opportunities from community college to accelerated learning opportunities. Specifically, San Francisco recently launched a new entry-level bootcamp with private-sector partner Zendesk and 30 initial participants. They are also launching a new online training program in partnership with Treehouse, another private sector partner, with a target to serve 250 participants in the next year. The San Jose TechHire, initiative in partnership with work2future, Year Up, #YesWeCode, Santa Clara County Opportunity Youth Partnership, McKinsey Social Initiative and Foothill College, will launch a new fast-track training program for tech-enabled middle-skills occupations including software programming, web development, computer user support and network administration. Targeting young adults and long-term unemployed individuals, SJ TechHire aims to train 1,000 individuals to increase and diversify the pool of local, qualified talent for placements in jobs, apprenticeships and internships with leading Silicon Valley employers in the information technology, manufacturing and healthcare industries. Partner employers including eBay Inc., Holdings, Inc., Cisco Systems, Inc., Facebook, Inc., Symantec Corporation, Synnex Corporation, Jabil Circuit, Inc. and Kaiser Permanente are committed to lending their support to this Initiative. Together, SJ TechHire training partners, employers and temporary work placement agencies will offer a robust catalog of online and classroom-based tech training programs as well as content and experiences to introduce students to tech-enabled career opportunities and provide them with an online assessment of current skills. The City of San Jose has secured over $2 million from city and state sources to drive forward these strategies with a focus on women, minorities, and youth. NMTechWorks is a community coalition in Santa Fe and Northern New Mexico with support from the Mayor’s Office, local employers, and non-profits. This multi-sector effort is designed to map, expand, and link pathways to tech careers, especially for rural, Native American, and Spanish-speaking community members. The Community Learning Network and StartUp Santa Fe are teaming with Cultivating Coders, a locally-based accelerated training provider, and others to grow the IT pipeline and train more than 500 students by 2020 for high-demand tech jobs with employers such as the Los Alamos National Laboratory, OpenEye Scientific Software, and Descartes Labs. The City of Seattle will train and place 350 people in tech jobs in 2016 and up to 2,000 people by 2020, in partnership with local tech employers like Sendachi, EnergySavvy, Skytap, and Substantial, and Moz, as well as community organizations such as Seattle Colleges, LaunchCode, and the Workforce Development Council of Seattle-King County. The City of Seattle will also collect and analyze job data by partnering with LinkedIn and Burning Glass Labor Insights to help partners align training with the skills that employers like Amazon, Boeing, Expedia, and Microsoft are seeking. In addition to training providers like the Galvanize, WTIA Workforce Institute, Code Fellows, and more Seattle’s TechHire initiative will also work to improve diversity and inclusion in the technology sector through training providers like Ada Developers Academy, a software development training for women; Unloop, training for people who have been in prison to succeed in careers in tech; and Floodgate Academy, a developer operations training focused on underrepresented communities. Since its launch, St. Louis has trained 106 students through its high-quality, accelerated training programs. 90 students have been able to obtain full-time employment after graduating, with an average income of $48,338. Through South Central Appalachia TechHire, southwest Virginia and western North Carolina will build a regional workforce trained in high-paying tech jobs, like software engineering and cybersecurity. It's truly a collective effort. Madison County, NC will partner with local universities and Tech Talent South to offer accelerated tech training through a new coding bootcamp, TechRamp Madison. The 13-week program will prepare graduates for jobs with regional and global technology employers who have committed to the region, including Digital Information Systems (DISYS), Epsilon, Inc., and Tata-BSS. In southwest Virginia, local employers will develop new cybersecurity courses at UVa-Wise and paid internships in high-demand STEM fields, and local community colleges will offer fast-track training programs for people who want to move from the energy sector into a technology job. A network of over 150 employers in St. Louis’ rapidly expanding innovation ecosystem will build on a successful Mastercard pilot to partner with local non-profit Launchcode, to build the skills of women and underrepresented minorities for tech jobs, and will also place 250 apprentices in jobs in 2015 at employers like Monsanto, CitiBank, Enterprise Rent-a-Car, and Anheuser Busch. LaunchCode targets unemployed or underemployed individuals and is working to build and recruit new bootcamps and training facilities. The City of Stamford and the Connecticut Department of Labor are working with Crashcode and The Business Council of Fairfield County to train and place 1,000 new workers into tech jobs by 2020 via an accelerated training program. Regional tech companies including Datto, CometaWorks, Comradity, GoNation, CTFN, and others will support with training design and hiring opportunities for graduates. The Mayor’s Office in Tallahassee is working with TalTech Alliance, a local-nonprofit committed to bringing together business, government, and education, and local tech companies, such as Mainline Information Systems (one of the largest tech employers in North Florida) to foster connections between candidates and tech employers with innovative training. As a result of these connections, Tallahassee aims to place 175 trained individuals into tech jobs in 2016 and over 455 by 2020. Tallahassee TechHire participants can expect to receive training from Tallahassee Community College’s adult vocational programs to meet tech employer demands. Additionally, multiple partners, such as the Alliance of Entrepreneur Resource Organizations are liaising with the Tallahassee’s TechHire initiative to connect graduates to employment opportunities. CareerSource Tampa Bay, Hillsborough County's workforce development board, will fast-track critical IT training and employment opportunities for well over 1,000 youth and young adults, ages 17 to 29, through the year 2020. Employers across industries, such as BayCare Health Systems, IBM and Cognizant Technology Solutions, are partnering with the initiative in order to advance the economic health and technology industry of the community. Tech Toledo, the Toledo Regional Chamber of Commerce, and OhioMeansJobs Lucas County are initiating an information technology workforce alliance to address short-term needs and develop longer-term programs for IT internships and apprenticeship programs. Tech Toledo will work with employers such as Meyer Hill Lynch, Toledo Lucas County Public Library, and The Andersons, Inc., to find and develop training to help fill their in-demand IT job needs. Tech Toledo will place at least 100 workers into tech jobs by 2020. The Trenton TechHire initiative is a cross-sector partnership between employers, City of Trenton’s My Brother’s Keeper Initiative, and Agile Strategies group, local education institutions, and local nonprofit organizations. This collaboration will prepare over 150 residents for tech jobs across sectors by 2020. Partners such as FCC Consulting Services, Tektite Industries, Inc., New Jersey Manufacturing Extension Program, and Power Magnetics, Inc. will meet regularly with Shiloh Community Development Corporation and the City of Trenton to strengthen and sustain the initiative. In Tulsa, 36 Degrees North, Techlahoma and a network of workforce and education partners will collaborate to quickly train candidates for tech jobs with local employers including ConsumerAffairs and Mozilla. With strong support from the Mayor’s Office, Tulsa TechHire plans to train and place 600 candidates, including women and youth, into tech jobs across sectors by 2020. Virginia TechHire unites employers, educators, nonprofits and other community leaders around growing the information technology sector—not only for Virginia’s economic competitiveness, but also for income mobility. Virginia will work with the Governor’s Office, Local Workforce Development Boards, technology councils, the Virginia Community College System, Dominion Resources and the Virginia Chamber of Commerce to train 1,200 TechHire participants in 2016 for open technology jobs. Federal funds, state support and private donations will be used to expand training and work opportunities for underserved populations. Between the Virginia Chamber of Commerce and the regional technology councils, a network of over 25,000 businesses will be connected to Virginia’s TechHire initiative, which will help place 10,600 Virginia TechHire graduates in tech jobs by 2020. Virginia sets the goal of partnering with 20 additional businesses by next year. In partnership with the Department of Employment Services, the Federal Court Services and Offender Supervision Agency, the Department of Human Services, the Office of Returning Citizens Affairs, the University of the District of Columbia Community College and the Workforce Investment Council, DC will engage IT businesses to develop and/or review competency-based curricula and to modify hiring processes for individuals with a criminal record. The HOPE project, alongside DC TechHire, has developed a business-driven strategy to train 200 offenders for in-demand IT jobs and place participants into jobs. Employers committed to provide opportunities to formerly incarcerated individuals include Competitive Innovations, Prism Inc., and Veredus. The DC Chamber of Commerce will also engage additional District-based tech firms to participate as internship and job placement partners. Learn more about TechHire activities already happening in government agencies America. In support of the TechHire initiative, VA is now inviting transitioning Servicemembers and Veterans from all eras to apply for seven no-cost Accelerated Learning Program (ALP) pilots in information technology (IT) this summer. This fiscal year, $5 million will be available for the programs, which will build on the training and technical skills gained by participants while in the military services, provide certification opportunities, and prepare program graduates to begin or advance in a high-demand careers in IT. ALPs are typically completed in less than six months and provide students with opportunities to learn online, in the classroom or in a combination of both. ALPs do not involve use of Post-9/11 GI Bill benefits – students can participate in these programs while also pursuing other programs of study utilizing Post-9/11 GI Bill benefits. After losing his home, Bruce Ives and his wife relocated from St. Louis to Kansas City and moved in with their daughter’s family. Unable to find a job, Mr. Ives enrolled in the RebootU Program, where he learned a new skillset. Now, Mr. Ives (who once described himself as the “world’s oldest intern”) has a new career in IT as an environmental analyst at the University of Kansas Hospital, with a pay rate of over $35 per hour.